Something special and unique is soon coming back to The Netherlands. The Wolf of Wall street could have specced this 1987 Lamborghini Countach 5000 Quattrovalvole. Lamborghini Polistorico (the brand new restoring facility in Italy) restored the car to get an official certificate of originality. The Countach was styled by Marcello Gandini of the Bertone design studio, the same designer and studio that designed the Miura. The Countach shape was wide and low (1.07 metres or 42.1 inches), but not very long (only 4.1 metres or 163 inches). Its angular and wedge-shaped body was made almost entirely of flat, trapezoidal panels. The doors, most often credited as a Lamborghini trademark, were a remarkable design feature for the Countach. They hinged at the front with horizontal hinges, so that they lifted up and tilted forwards. The main reason is the car’s tubular spaceframe chassis results in very high and wide door sills. It was also partly for style, and partly because the width of the car made conventional doors impossible to use in even slightly confined space. 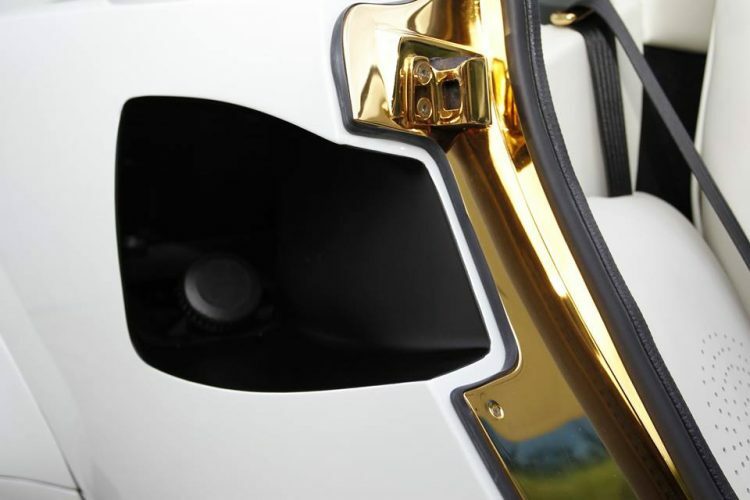 When trying to figure out if the gold on different door- and interior parts of the car were an aftermarket piece, Lamborghini called and told us that it was an original option at the time. It’s a kind of crazy, but crazy is special in it’s own way. Would you drive it?